This page links through to a series of performed electronic/electroacoustic works that employ graphic notation and adaptable controllers (controllers with no specific musical use, e.g. 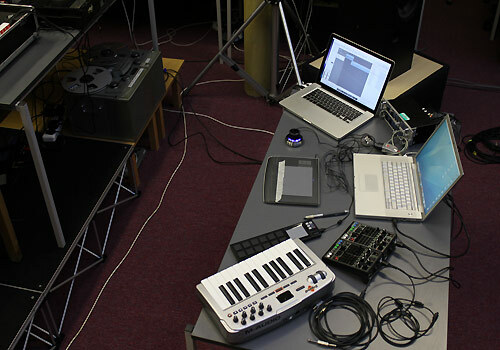 graphics tablet, 3d "mouse", monome etc. ), submitted for a PhD in Music Composition at The University of Edinburgh in December, 2010. The PhD Submission is titled "Interpretive Electronic Music Systems", and the works exhibit a combination of abstract and abstracted syntax, and aural and mimetic discourse (if you don't know what this means, read Simon Emmerson's "The Language of Electroacoustic Music"). The works can be considered systems from the perspective of combinatory relationships and dependencies between notation, software, hardware, and sound library, and the software is a subsystem that demonstrates environment, boundaries, structure and interconnectivity.